Forgive my photo quality. I don't have a camera right now, so I took this using the webcam in the laptop. Last week, I didn't join the yarn along because I hadn't really gotten anywhere in my crocheting. I'd made a mistake, and when I tried to pull it out, the yarn ripped. I still haven't gotten anywhere. I'm debating what to do. I was making a scarf, but I'm not sure. I'm taking suggestions... simple ones that I can make up as I go along. I've never followed a pattern before. And I only have the one thing of yarn, so I can't make something fun like a blanket (I've only ever made two, but I enjoyed both of them). I don't know. I'm debating scarf or hat... It's been like 8 months since my last project (I'm a fall and winter yarn person) so I'm trying to do something that will be easy and get me back into that groove. Any ideas? In case you think I'm not being crafty though, I made jewelry! Huh? I just don't have the patience for that now. It's not a bad book, just a difficult one. My mom laughed at me for trying to read it, saying there's no need, but I'm stubborn. I'll go back to it... later. I joined a second program where I review on my blog for free books. I posted my first review for them yesterday, on Raised Right by Alisa Harris. The last book I reviewed from the project I was already in was Going Deep by Gordon MacDonald. I've requested a fiction book next (my first since I joined the program) which I'm looking forward to getting in the next couple days. 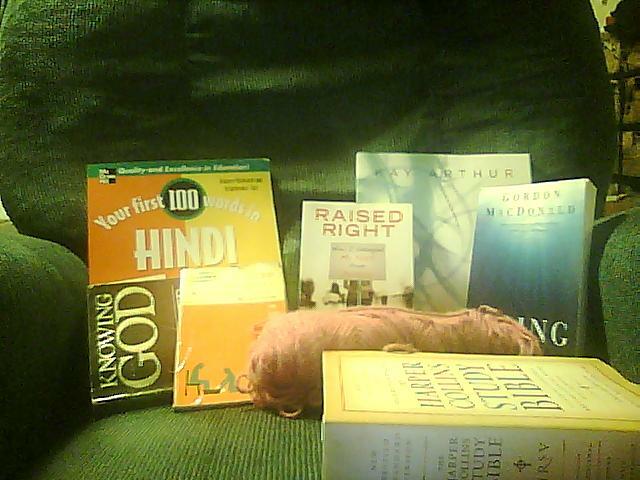 I got some books from my church, including The Harper Collins Study Bible. I'm really having fun diving into one of the other ones right now as well, which aren't pictured. Last week I joined a new women's Bible Study, so now I'm doing week one of Kay Arthur's Covenant, which involves homework. I've been out of school for enough years I find this kind of fun. And then, of course, I'm reading the Psalms! Specifically, I mean I've decided to do a Psalm a day (for 150 days) right here on the blog. At the end of the week, I do a link up so if anyone wants to reflect on any of the Psalms of the week they can join us! I'm trying to get through an ebook I downloaded for free the other day. I don't have an e-reader, so I'm just reading it on my netbook. I'm not really a huge fan of reading on a backlit screen, but I know when I move to India I don't think I'll qualify to get print books from the book review programs, so I need to get used to it... or get an ereader that's designed to minimize eyestrain. Which would be awesome, but there's plenty of needs with more financial priority before I get that! Reading things on my netbook will do for now. But I definitely am only requesting print books while I'm here in America, I think. I'm also starting to study Your First 100 Words in Hindi from McGrawHill. Ryan and I had a ton of fun the other day with me trying to read their pronunciation and have him guess what the word I was trying to say meant. Not only did I learn Hindi pronunciation does not come naturally to me, that the region Ryan lives in tends to drop the n at end of some words, and that Ryan really does speak Hinglish. There were a few words I'd say, he's admit he had no clue, and when I told him it meant dog or whatever, he'd say "Oh. We just say 'dog'." I want to actually learn Hindi, so I'm hoping to get to wifi so I can get on the webcam with one of Ryan's natively Hindi speaking friends (Ryan's a native English speaker) and hold up the Hindi flash card (it's got the word written in Hindi script on one side) and have them tell me the pronunciation. Since the book doesn't come with audio materials, I have to guess what the author means when they type "aa" instead of "a", for example, when they're spelling out the phonetics. Additionally, I want to learn the regional accent of where Ryan is... it doesn't make sense for me to learn the accent of another region! And, not related to either yarn or books, I have a job interview today! I've been unemployed for 18 months, and I desperately need a job. So I'd appreciate prayers!